Add some colour into your kitchen with the Atomic Rainbow Sifter Grinder. Sifter grinders are the perfect choice for those who want to get the most out of their culinary herbs and this 4 stage grinder is no exception. The Atomic Rainbow Sifter Grinder is made from metal and features an array of razor sharp teeth that can grind up your herbs in a matter of seconds. The 4 part design captures herbs at different stages from coarse to fine meaning that the most potent parts of the herbs are stored in the bottom for when you want a bit more kick to your cooking. 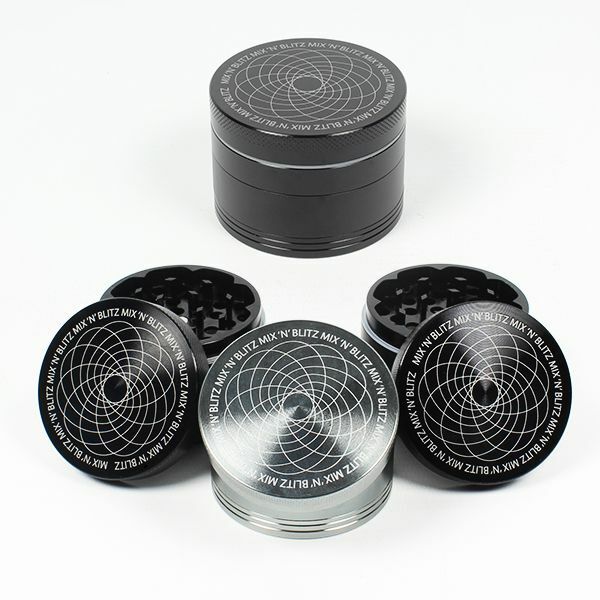 This grinder comes in a handy Atomic branded tin for safe keeping and also includes a small plastic scraper so that you can collect all of your grinded herbs. The Atomic Rainbow Sifter Grinder is available now for £21.99 and makes a colourful addition to any kitchen. The Chube Buddy Silicone Grinder Keyring is an air tight, smell proof and water resistant herb grinder which is small enough to take with you wherever you go. The Chube Buddy Silicone Grinder can grind your herbs in a matter of seconds by just using your hands; placing the grinder between your fingers and rolling it back and forth effortlessly grinds your herbs into more manageable pieces ready for use. Made from durable silicone, this grinder is almost unbreakable and is water resistant, keeping your herbs safe until you need them. The non-stick silicone teeth makes it easy to get all of your herbs out and is really easy to clean, making it a great travelling companion. The Chube Buddy Silicone Grinder Keyring is available in a range of colours including black, blue, green and yellow and at just £7.99 is a cost effective grinder for when you are on the move. These colourful silicone covered sifter grinders, work wonders on dried herbs, tobacco products and other dried plant materials, if you are feeling generous, and they would also make a fantastic gift. The silicone covered aluminium sifter grinders, will are not just stylish and colourful, they make light work of shredding and fluffing herbs to a perfect fine consistency, also the precise holes ensure only herbs ground to the correct size pass through. Thanks to their razor sharp teeth grinding your kitchen herbs or tobacco products is effortless, and the silicone cover ensures that nothing escapes avoiding waste. Herbs gather in the middle chamber while fine pollen filters through a mesh screen and collects in the bottom compartment. Experience tells us that with some grinders you lose some of your tobacco or herbal blend if it becomes too finely ground, with the Silicon Covered Aluminium 63mm Sifter Grinder you can be certain that the herbs will be just as you like them. We are offering these sifter grinders in five attractive colours; Black, Green, Blue, Yellow or Pink, all priced at just £19.99. Very much the essential to any well run kitchen is a supply of freshly ground herbs and spices, this is when a good grinder becomes an essential tool. You don’t just have to use grinders in the kitchen, with herbs, they are also useful for grinding tobacco, for thick and woody rolling tobacco, and they do a great job. We offer a huge selection of grinders at our website, but we like the look of the Bud Buddy2 from CheekyOne and we have to proclaim that this is a neat and very effective grinder, thanks to the super sharp teeth and a thoughtful textured grip. We found that the original Bud Buddy design was good, but with this latest version the steel pins of the Bud Buddy Original have been replaced with sharp edged teeth, to make grinding your culinary herbs and spices even easier. The BudBuddy2 is easily portable and compact, but do not be fooled by the size; these super sharp teeth will literally shred any herb or spice placed between them. The result, your ground mixture will fall down and the extra steel mesh will only allow the tiniest and most important part of the herb to fall through. 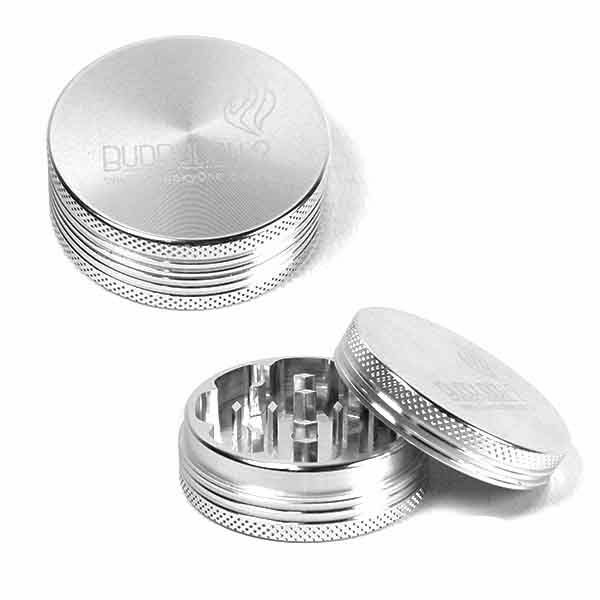 This grinder is suitable for most culinary herbs and spices, pepper corns and cinnamon for example, also tobacco and herbal mixtures, with the central magnets, the lid will not come “flying” off and sit safely on the top, completely functional and super stylish – the Bud Buddy 2 will be the best buddy you can buy. Use a little vegetable oil to keep the sealing ring lubricated and we recommend that it is kept pristine and untainted by using our Number 1 Grinder Cleaner. Before we can enjoy a cool smoke in our Chillum, Pipe or Bong, we have to get down to the serious business of preparing our favourite herbs. How this is done is often down to personal preferences, but aficionadas of the water pipe prefer to separate the most potent part of the herbs, or resin to get the best from the smoke. We offer many grinders, a number of these have a collection department or filter to make the separation easier. A recent addition to our collection is the Mix ‘N’ Blitz 55mm Isotope Sifter Grinder which features super sharp teeth grind up your ingredients in seconds making your herbs more manageable. The mesh or sifter then filters all the most potent part of your herbs into the bottom compartment where you can use them or even save them up for a rainy day or mix in as you please. 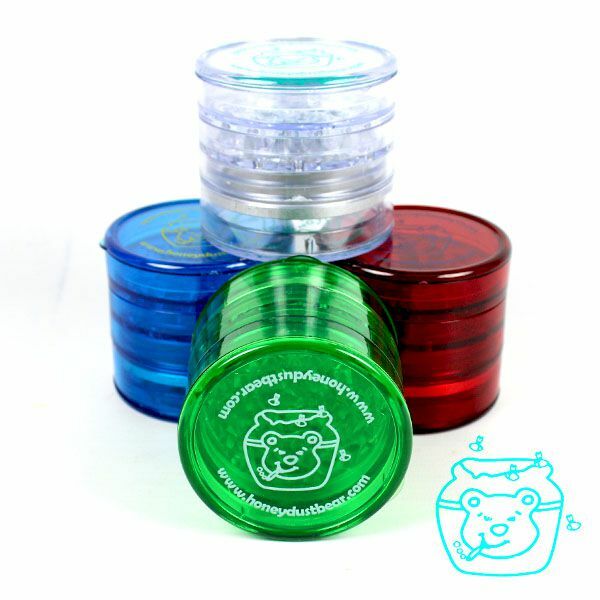 These grinders are offered in eight funky colours, Black, Silver, Purple, Red, Pink, Blue, Light Blue and Grey. We recommend use of our grinder cleaner with this item so that it will continue to provide the best of herbal mixture, for your smoking pleasure. Your choice in any selected colour for only £17.99. 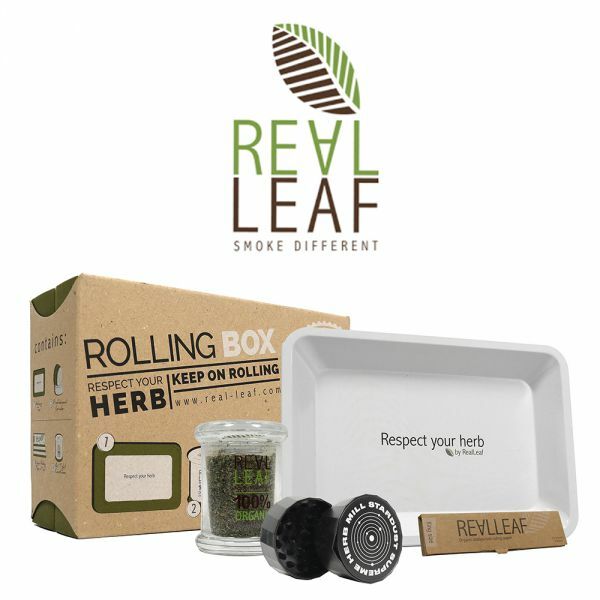 Getting your herbs, spices or tobacco to just the right consistency is what most of us will be looking for when we want to conjure up that culinary delight, or enjoy the very best cool smoke with our bong or “ roll up”. But, getting it “just right” is not always easy, unless of course, you have a Head Chef Medi-Pod grinder. We all now know that grinders do make life so much easier for the budding chef or at home cook, but naturally they need not be just confined for kitchen us, they can be used for grinding tobacco into the consistency that is just right for rolling, your pipe or cool bong. This could present a problem if you are “out and about” but, not with the Medi-Pod grinder which provides a neat little storage and grinding solution, perfect for anybody looking for a compact solution to take out and about with them. Your freshly ground tobacco will not become tainted either, the Medi-Pod has an air tight storage container along with the grinder and milling bowl. Now in order to ensure that the herbs, spices or tobacco are always in tip top condition, just like your kitchen surface or bong, keeping it clean is a must. Cleaning can of course be a bit of a “turn off” but, with the help of our No. 1 Grinder Cleaner, which comes in a handy 50ml spray bottle, all that you need to do is simply spray a little of the cleaner onto your grinder, wait a few moments while it does its stuff and simply rinse and dry to clean it off. 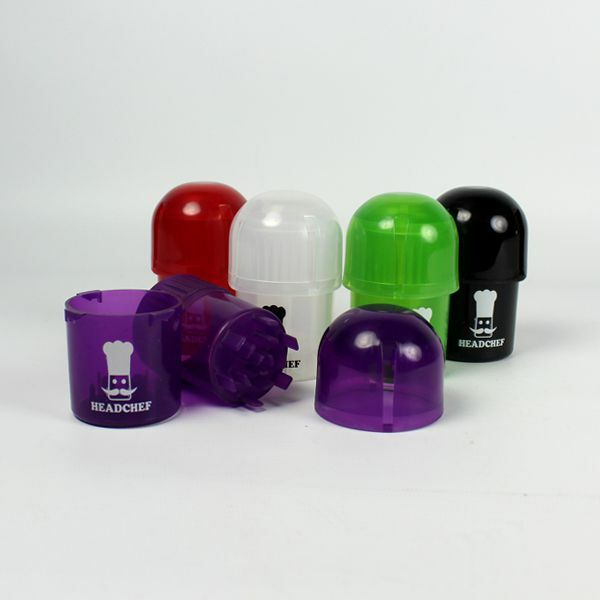 We are currently offering this Pod Grinder for just £4.99 and it is available in Black, White, Purple, Red, and Green. Grinders really do make life easier for the budding chef or at home cook, not only do they make life easier, but save you time when it comes to chopping up your herbs and spices. However, they need not be just confined for kitchen us, they can be used for grinding tobacco into the consistency that is just right for rolling, or your pipe or cool bong. The Red Eye 40mm Crystal Twist Grinder is a quality grinder that is regarded as one of the most innovative products on the market, two items in one in fact because it which can be used as either a classic two part grinder or as a sifter. To use it as a sifter all you have to do is to screw parts 1 and 4 together and it then becomes a superb sifter grinder. Featuring a very strong magnet, this ensures that your Crystal Twist Grinder stay firmly closed that is until you have finished grinding or sifting, and it is decorated with the Red Eyes cool graphics. The Red Eye Grinder is manufactured from the highest quality aluminium; it is anodised to ensure that it is both smooth as well as tactile and is offered by us in nine attractive colours. Choose from Black, Blue, Pink, Red, Silver, Gun Metal Grey, Gold, Green and Purple. So with the Red Eye 40mm Crystal Twist Grinder, all that is requires is for you to pop in your herbs, spices or tobacco and in just a few seconds you have exactly the right mixture that you need. Thor was a Norse mythological god of Thunder, popularly associated with lightning, storms, oak trees, strength, as well as the protection of mankind, and this superb grinder is inspired by him. The lightning bolt featured is tribute to that other god, this time in Greek mythology Zeus. He was the god of the sky and ruler of the Olympian gods, his weapon was a thunderbolt which he hurled at those who displeased or defied him, especially liars and oath breakers, so watch out! With the sharp lightning bolt shaped shark teeth this classic sifter grinder, this will ensure that all your herbs are ground to the perfect consistency every time. We think that you will agree that the Thorinder Sifter Grinder, constructed with anodised aluminium and medical-grade stainless steel, is not only a beautiful thing to look at, it is completely functional and easy to use. Comprising four layers, you can choose exactly the right consistency for your herbs and spices and it has a magnetic lid to keep your herbs safe at all times. Supplied in two sizes, 50mm or 62mm and in a range of colours, which include green, grey, orange as well as blue; we can confidentially say that the Thorinder herb grinder from After Grow is the ultimate tool for all your grinding requirements, making light work of even large amount of herbs and spices, reducing them into different consistencies to give you the best quality and flavours. This is one of the best grinders to hit the UK market, from reactions we believe that it will take the market by storm, and it is cleverly designed with four compartments to ensure that you get the particles of just the right size. The top compartment is where you put in the herbal mixture of your choice, the second compartment is where the all-important grinder is situated and when it gets to work, the ground mixture falls into the compartment below. This is where the important separation takes place as it has a stainless steel mesh crystal catcher which will only allow pollen like particles to drop though into the fourth compartment. What you have now is honey dust which is heaven to smoke, so we can imagine that you would never want to be without your Honey Dust Grinder wherever you went. From the comments that we have seen, the Honey Dust Grinder not only produces a superb smoking mixture, but it is robust, requires only the minimum maintenance and can withstand the odd knock without falling to pieces. Available in five distinct colours, you can choose between blue, clear, green or red. Your pollen dust is at your fingertips.